1 of 2 Heat oven to 350 degrees F. Coat nonstick 12-inch pizza pan with nonstick cooking spray. Spread cookie dough out evenly in prepared pan, pressing with fingers to flatten. 2 of 2 Bake in 350 degree F oven for about 17 minutes or until the cookie dough is lightly browned. Let cookie pizza cool completely in pizza pan on a wire rack. 1 of 1 Spread raspberry preserves evenly over cookie pizza to within 1 inch of edge of pizza. Sprinkle chocolate pieces, peanuts and flake coconut evenly over the preserves. 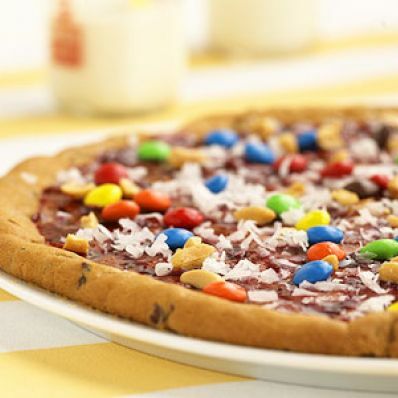 Cut the cookie pizza into 12 pizza-shaped slices. Per Serving: 98 mg sodium, 2 g fiber, 4 g sat. fat, 10 mg chol., 10 g Fat, total, 38 g carb., 3 g pro., 248 kcal cal.